In the morning, as I finished meditating, Raghvendra came and said it was time for me to meet the Maharishi. I followed him out into the intense Indian sun and walked to the Maharishi’s whitewashed bungalow. His house sat in a grove of trees at the edge of the cliff. We walked up the stone path, crossing the well-kept lawn between two small fountains, past flowerbeds filled with yellow and orange marigolds. Several steps led up to a wide porch where we left our sandals. We entered a small, bright meditation room, separate from his private quarters, in back. There was a low dais for the Maharishi and the floor was covered with white futons. We sat cross-legged on the floor in front of the dais and waited. A few minutes later, voices approached from outside. The door swung open and, after removing their shoes and sandals, John, Paul, Ringo, George, Cynthia, Pattie, Maureen, and Jane all came in. “Hi, Paul, how are you?” asked Ringo. “That’s what happens here,” said George, smiling, as everyone sat cross-legged around us. George pressed the play button and began to sing along with his recorded voice and music, smiling shyly like a new father as his song, The Inner Light, filled the room. The Maharishi, rolling his prayer beads between his fingers, laughed approvingly. The Maharishi never did notice me but I didn’t mind at all. 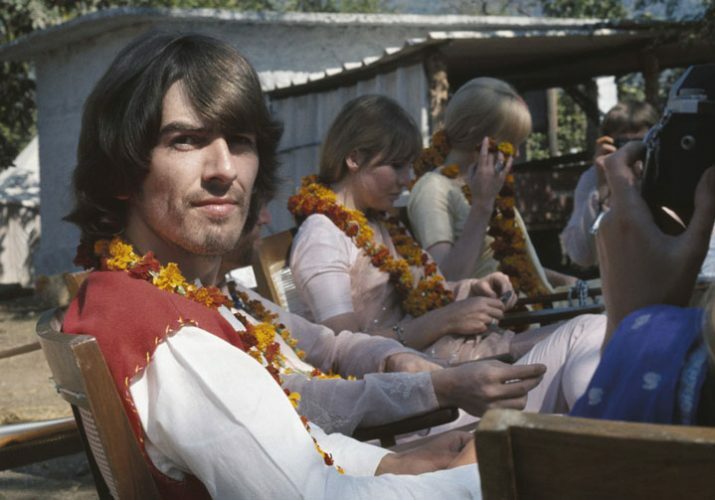 Sitting right beside George, listening to him sing, I felt blessed.